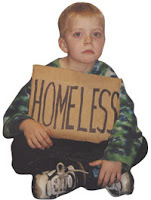 · About 50 percent of the homeless are African-American, 35 percent Caucasian, 12 percent Hispanic, 2 percent Native American, and 1 percent Asian. Now, with the economic crisis affecting the U.S. and subsequently rippling across the globe, expect to see more homelessness due to foreclosures in real estate. Both homeowners and renters of foreclosed properties will be affected. Does this stark increase look ominous? Carolyn Brodersen is a nonfiction writer, award-winning political and food blogger. She also pens book reviews, health articles, and how-tos. She is a published poet, with her works appearing in literary magazines and anthologies. Got a Traffic Ticket in the Mail for a Right on Red at an Automated Enforcement Light? Do You Know the Ricin Man? The Ricin Man, the Ricin Man . . .